Interstitial lung diseases (ILDs) are a heterogeneous group of conditions, with a wide and complex variety of imaging features. Difficulty in monitoring, treating and exploring novel therapies for these conditions is in part due to the lack of robust, readily available biomarkers. Radiological studies are vital in the assessment and follow-up of ILD, but currently CT analysis in clinical practice is qualitative and therefore somewhat subjective. In this article, we report on the role of novel and quantitative imaging techniques across a range of imaging modalities in ILD and consider how they may be applied in the assessment and understanding of ILD. We critically appraised evidence found from searches of Ovid online, PubMed and the TRIP database for novel and quantitative imaging studies in ILD. Recent studies have explored the capability of texture-based lung parenchymal analysis in accurately quantifying several ILD features. Newer techniques are helping to overcome the challenges inherent to such approaches, in particular distinguishing peripheral reticulation of lung parenchyma from pleura and accurately identifying the complex density patterns that accompany honeycombing. Robust and validated texture-based analysis may remove the subjectivity that is inherent to qualitative reporting and allow greater objective measurements of change over time. In addition to lung parenchymal feature quantification, pulmonary vessel volume analysis on CT has demonstrated prognostic value in two retrospective analyses and may be a sign of vascular changes in ILD which, to date, have been difficult to quantify in the absence of overt pulmonary hypertension. Novel applications of existing imaging techniques, such as hyperpolarised gas MRI and positron emission tomography (PET), show promise in combining structural and functional information. Although structural imaging of lung tissue is inherently challenging in terms of conventional proton MRI techniques, inroads are being made with ultrashort echo time, and dynamic contrast-enhanced MRI may be used for lung perfusion assessment. In addition, inhaled hyperpolarised 129Xenon gas MRI may provide multifunctional imaging metrics, including assessment of ventilation, intra-acinar gas diffusion and alveolar-capillary diffusion. PET has demonstrated high standard uptake values (SUVs) of 18F-fluorodeoxyglucose in fibrosed lung tissue, challenging the assumption that these are ‘burned out’ and metabolically inactive regions. Regions that appear structurally normal also appear to have higher SUV, warranting further exploration with future longitudinal studies to assess if this precedes future regions of macroscopic structural change. Given the subtleties involved in diagnosing, assessing and predicting future deterioration in many forms of ILD, multimodal quantitative lung structure-function imaging may provide the means of identifying novel, sensitive and clinically applicable imaging markers of disease. Such imaging metrics may provide mechanistic and phenotypic information that can help direct appropriate personalised therapy, can be used to predict outcomes and could potentially be more sensitive and specific than global pulmonary function testing. Quantitative assessment may objectively assess subtle change in character or extent of disease that can assist in efficacy of antifibrotic therapy or detecting early changes of potentially pneumotoxic drugs involved in early intervention studies. Imaging plays a key role in the diagnosis and assessment of interstitial lung disease (ILD). A multidisciplinary team with expertise in ILD can often reach a reliable diagnosis based on clinical findings and radiology alone, as exemplified by the Joint Consensus International Societies Statement on the classification of idiopathic interstitial pneumonias.1 In practice, radiological examinations are qualitatively interpreted with an inherent degree of subjectivity. However, ILD features such as honeycombing are often subtle and may be mimicked by other conditions, leading to interobserver disagreement in their presence and extent.2 Thus, interest exists in developing quantitative and novel imaging tools. We provide a commentary on the recent developments in novel imaging techniques in ILD, with a focus on quantitative high-resolution CT (HRCT) and new techniques from MRI and positron emission tomography (PET). Literature searches were performed using the Medline database via Ovid online portal at the University of Sheffield (UK) and cross-referenced with identical search terms on PubMed and TRIP database (both web based and open access). Two reviewers (NDW and JAE) independently performed the search and identified articles for inclusion. Only human studies since 1998 with n>1 were included. Studies were assessed on methodological approach, bias and quality using the Scottish Intercollegiate Guidelines Network (SIGN) checklist. In case of disagreement about inclusion, an arbitrator (JMW) made the final decision and acted as guarantor. The Preferred Reporting Items for Systematic Reviews and Meta-Analyses flow diagram and search terms are provided in two online supplements. HRCT is a highly sensitive imaging tool for the assessment of macrostructural changes in ILD. In the era of multidetector CT scanners, volumetric protocols acquired during inspiration are preferred to non-contiguous slices due to enhanced sensitivity to spatially heterogeneous ILD features.3 HRCT plays a key role in identification of the pathological phenotype of ILD, and typical imaging features are well recognised in international consensus guidelines.1 Even so, disagreement on presence or quantification of disease severity between independent radiologists is common.2 4 5 Semiquantitative CT scoring analysis by expert radiologists may provide prognostic insight,6 but there remains no standard method for scoring radiological extent or severity. 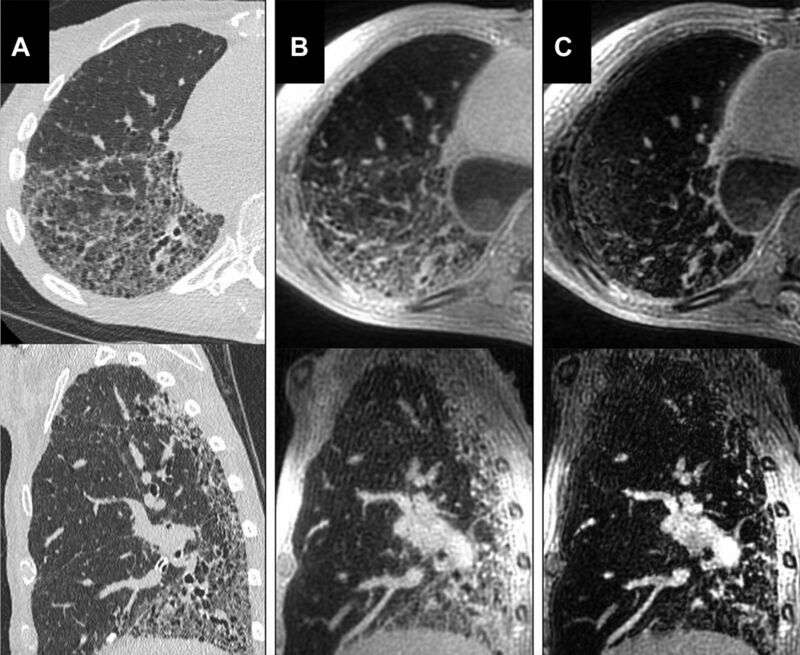 Quantification of overall lung histogram features, regional CT density changes, parenchymal texture features and other assessments by advanced algorithms including unsupervised machine learning and deep learning approaches to image analysis have the potential to standardise and develop the role of HRCT in ILD. HRCT density measurements have been used to quantitatively assess lung structure in a range of respiratory conditions, most prominently in emphysema.7 The CT density histogram of normal lung tissue is peaked at approximately −800 Hounsfield units and is left-skewed. An increase in the amount of soft tissue, due to fibrosis, will increase mean lung density (MLD) and decrease the histogram kurtosis and skew.8 Whole-lung CT metrics, such as MLD,8 or lowest fifth percentile of the lung density histogram,9 correlate with physiological measures of severity, and change with disease progression.10 Although several studies have explored the relationship between density histogram metrics and ILD outcomes,11–14 reducing quantitative regional information from highly sensitive imaging to global summary measurements sacrifices the richness of the imaging data. Global measures are also confounded by other features such as air trapping in hypersensitivity pneumonitis (HP) and parenchymal destruction in combined pulmonary fibrosis and emphysema (CPFE) syndrome. Asakura et al created the Gaussian Histogram Normalized Correlation (GHNC) system, which uses local histograms and the degree of CT attenuation to separate the lungs into five categories.25 Using GHNC, Iwasawa et al showed a smaller increase in fibrosis score and F-pattern volume on the follow-up CTs in 38 patients with IPF treated with pirfenidone compared with 40 age-matched controls with IPF.5 There were no significant differences in the sensitivity, specificity and accuracy between GHNC analysis, visual CT score and radiologist interpretation. Computer Aided Lung Informatics for Pathology Evaluation and Rating (CALIPER) is an image analysis tool that uses both 3D histogram features within a regional voxel and morphological analysis to characterise HRCT data. The classifier was developed based on consensus radiologist determination of parenchymal features of voxels randomly selected from training images with histopathologically confirmed disease for a variety of lung parenchymal pathologies and control subjects29–31 from the Lung Tissue Research Consortium.32 In retrospective clinical assessment of 55 patients with IPF, CALIPER-measured ILD changes including percent ILD, total ILD volume and total reticulation volume were associated with survival at multivariate analysis.33 An example output from CALIPER in a patient with UIP is shown in figure 1. Representative results from the quantitative analysis of CALIPER. Each row (A–C) and (D–F) correspond to the two timepoints from one patient with usual interstitial pneumonia. The individual voxels of the lung regions in the original sections (A and D) are classified and colour coded into one of the classes of visible abnormalities (B and E). Three-dimensional maximum feature projections are also shown (C and F). Reproduced with permission from European Respiratory Society.33 CALIPER, Computer Aided Lung Informatics for Pathology Evaluation and Rating. As the volumetric assessment of the size and morphology of branching vascular structures is extremely difficult for a radiologist, this novel metric highlights the potential utility of quantitative measures that do not have a current visual or morphological correlate in the radiology lexicon. Additional machine learning or deep learning techniques may elucidate features that are not perceptible nor reproducibly assessed by humans. Lack of standardisation of inspiration level during CT acquisition may also lead to differences in density. Previous data suggests inspiration to a lung volume 90% of vital capacity yields the most reproducible density results.41 However, spirometric gating is not routinely available in most centres, and some researchers report adequate reproducibility without spirometric standardisation of inspiratory effort.12 Comorbidities such as heart failure or exogenous factors such as contrast media are likely to affect the overall lung density, but quantitative analysis of their impact is lacking. 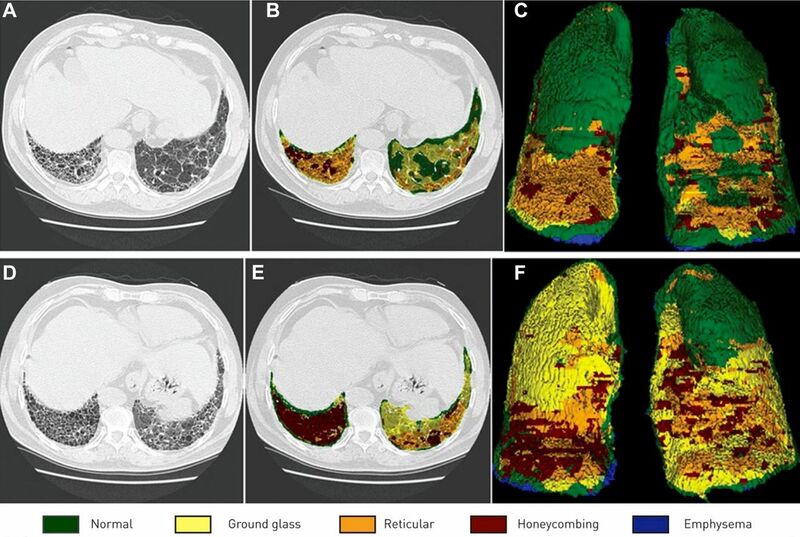 Recent significant advances in quantitative CT have been made in semiautomated lung segmentation and greater success in the automated identification of honeycombing using texture analysis, alongside new means of assessing the associated pulmonary vascular changes. While global physiological indices of disease progression such as PFTs are affected by comorbidities such as emphysema, ideally quantitative CT should objectively and accurately measure structural interstitial change as a standalone parameter, enabling effective analysis of treatment response or objective assessment of disease progression. At present, these methods require varying degrees of manual input, which will need to be automated before rolling out the technology for use in routine clinical practice. Regional T1 and T2 relaxation time characteristics of lung tissue may discriminate ILD pathology. Stadler et al demonstrated that the T1 of fibrotic lung parenchyma is significantly longer than emphysema, but these T1 values were heavily influenced by lung inflation state.52 Buzan et al observed that GGO, reticulation and honeycombing have inherently different T2 relaxation times in 12 patients with NSIP or UIP.53 A larger study by the same author published 2 years later confirmed a strong positive correlation between T2 relaxation and proton density in NSIP (r=0.64, p<0.001), but this correlation was weak in UIP pattern of fibrosis (r=0.20, p=0.01).54 In the NSIP group, those with suspected inflammatory activity had statistically significant increased T2 relaxation times when compared with those with suspected stable disease. Unfortunately, the difference in T2 relaxation times between UIP and NSIP was not statistically significant, thereby suggesting that T2-weighted proton MRI is not a reliable method to differentiate between these two important patterns of pulmonary fibrosis. MR elastography (MRE) is a method of measuring tissue stiffness by measuring acoustic shear wave propagation. A recent study by Marinelli et al used MRE to quantify a difference in topographical distribution of shear stiffness between 15 patients with ILD (including eight with IPF) compared with 11 healthy volunteers.55 They found that with increasing transpulmonary pressure (from residual volume to total lung capacity), the lung stiffness increased. It would be interesting to see if future studies using MRE in ILD can demonstrate this as a valuable diagnostic tool in monitoring of disease progression and providing dynamic lung function data. Oxygen-enhanced MRI uses the paramagnetic (T1-shortening) effect when molecular oxygen dissolves in tissue water and blood in the lungs. By acquiring images using a paradigm of alternating inhaled oxygen at room air concentration and high flow oxygen and thereafter subtracting the images, maps of T1-shortening are derived. Müller et al found a statistically significant difference in the signal intensity (SI) changes and SI slopes between 17 patients with various pulmonary diseases (including 12 with IPF and 1 with HP) and 11 healthy volunteers.56 A strong correlation was seen between the SI slope values and diffusing capacity of the lungs for carbon monoxide (DLCO), but the correlation was weak between SI change values and DLCO for the section selective inversion pulse. Ohno et al demonstrated enhancement changes in patients with CTD-ILD versus healthy controls.57 Molinari et al used ‘percentage of oxygen-activated pixels’ (OAP%) as a quantitative metric, demonstrating a correlation of OAP% with DLCO in a cohort of patients with various forms of ILD.58 Given that the oxygen environment is dependent on both local ventilation and perfusion, separating the contribution of each is a significant current challenge. Example of whole-lung spectral peaks generated from hyperpolarised xenon magnetic resonance spectroscopy. Figure part A is generated from a healthy volunteer. The red blood cell (RBC) peak is relatively preserved. In mild (B) and severe (C) IPF, with gender, age, and physiology (GAP) scores 1 and 3, respectively, the RBC peak is diminished with respect to the tissue/plasma peak, suggesting a diminishment in gas transfer efficiency of the lung. In patients with interstitial lung disease (ILD), transit time of intravenous contrast across the lungs is increased in anatomical regions of interstitial change. The rows (A and B and C and D) represent two patients with ILD. The coronal reconstruction of their CT scans demonstrates ILD, predominantly in both bases in A and predominantly in the left lung periphery in C. Transit times within these voxels in the parametric maps derived from dynamic contrast-enhanced MRI (B and D) demonstrate increases in transit time through these area, suggesting perfusion limitation. Early and late contrast enhancement features may also help differentiate inflammation from fibrotic-predominant pathology. Yi and colleagues dichotomised biopsy specimens from 26 patients with UIP into inflammation or fibrosis predominant, finding that early T1 enhancement was more likely to be associated with inflammation.70 Mirsadraee et al also demonstrated the feasibility of pre-contrast and post-contrast T1 mapping of IPF.71 In 10 patients with IPF, contrast uptake was delayed compared with 10 healthy volunteers, including in regions with ‘normal’ precontrast T1 values, suggesting that early perfusion changes may be detectable prior to morphological changes. Another study also demonstrated that late contrast-enhanced MRI signal was significantly increased in the lungs of 20 patients with IPF compared with 12 healthy volunteers.72 There was a strong correlation between the degree of pulmonary fibrosis on late enhanced MRI and HRCT. Several MRI metrics from conventional, oxygen-enhanced, hyperpolarised gas and DCE MRI are under exploration. A number of promising methods are available; however, assessment of the reproducibility of derived metrics and longitudinal observation in human participants with ILD is required to assess their suitability as accurate markers of disease. Functional MRI metrics will also benefit from direct comparison with structural imaging approaches through image registration techniques. Novel molecularly sensitive MR techniques such as collagen-targeted chelated MR agents,73 or acidoCEST MRI for extracellular pH estimation,74 may provide further opportunities for novel MRI of ILD in the coming years. At present, this remains a research tool, but use in early phase pharmaceutical intervention programmes can be envisaged in the near future. Other authors have explored the role of PET in fibrosis-predominant ILD80 and reproducibility in IPF.81 A small study involving eight patients with IPF showed that over a period of 6 months, the decline in FVC was strongly correlated with an increase in maximal SUV but was not associated with the visual CT score.82 Umeda et al demonstrated that delayed-phase 18FDG uptake may provide a marker of disease activity in idiopathic interstitial pneumonia83 and later also specifically in IPF.84 Increased late phase uptake was predictive of mortality on both univariate and multivariate analysis. Although the numbers in both studies were relatively small, the IPF cohort was prospectively followed up for a median of 29 months, with 25 deaths.84 In a larger cohort of 113 patients, Win and colleagues demonstrated that the target to background ratio, calculated by dividing the maximal SUV by minimal SUV, predicted mortality over a mean 29-month follow-up, independent of GAP score.85 Novel PET tracers and targets such as somatostatin receptor analogues,86 cathepsin protease (macrophage labelling),87 labelled leukocytes88 and type I collagen89 have shown early promise in ILD assessment and further reports are awaited. The high SUV seen in normal lung tissue in patients with ILD is intriguing. 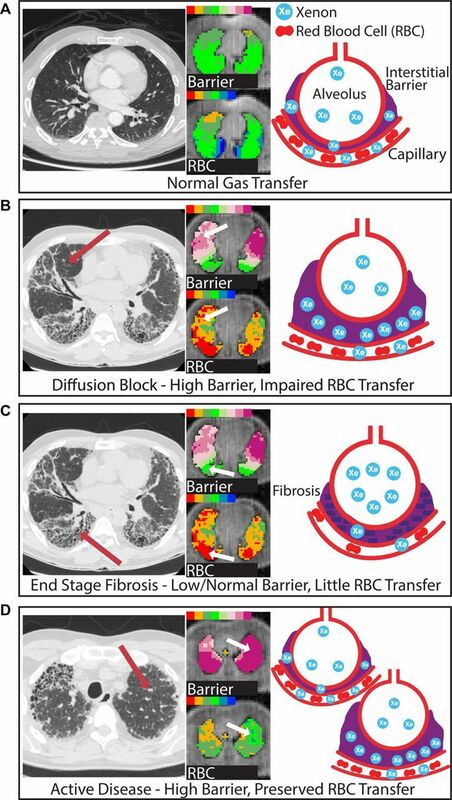 Further dual-time-point studies would be useful to assess if these areas go on to develop appreciable fibrotic change on structural images, ideally using formal CT registration tools. Novel PET tracers are yet to be clinically assessed and although they are promising, the requirement on a cyclotron for on-site manufacture of these short-lived molecules may inhibit widespread uptake. 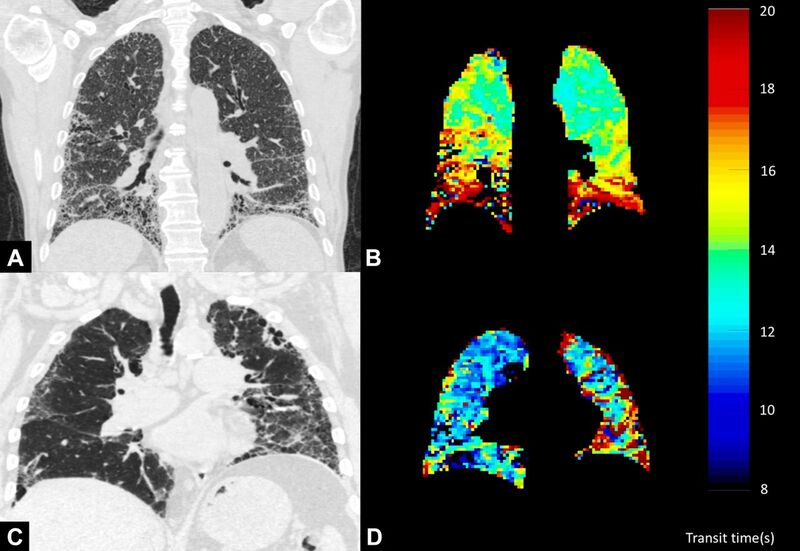 Quantitative analysis of multimodal imaging is likely to play an increasing role for combined pulmonary structure-function assessment in many pulmonary disorders. While these approaches require further external validation and are not yet ready for routine use in clinical practice, they are likely to be additive to ILD assessment and may play an important role in diagnosis and assessing treatment response. Quantifying pulmonary vessel changes may prove to be an outright novel metric in ILD assessment. There is great promise that both supervised and unsupervised approaches applied to large, well-characterised datasets may lead to discovery of additional meaningful features of ILD (radiomics or imaging biomarkers). Clustering techniques and machine learning may allow automated stratification of patients into disease categories and risk groups and provide decision support that may aid in the selection of optimal therapy and a means to assess efficacy. MRI and PET remain exploratory techniques in ILD but may provide a link between functional and anatomical elements of disease, such as is demonstrated by regional gas exchange in129Xe MR spectroscopy. Novel PET tracer agents may be used in early drug development programmes and indeed a study using FDG PET avidity to assess response to dabigatran in IPF is currently recruiting to trial (ClinicalTrials.gov identifier NCT02885961). The authors would like to acknowledge the TRISTAN consortia publication board for review and approval of this manuscript (www.imi-tristan.eu).
. Parenchymal emphysema measured by CT lung density correlates with lung function in patients with bullous disease. Eur Respir J1993;6:698–704.
. Nonspecific interstitial pneumonia versus usual interstitial pneumonia: differences in the density histogram of high-resolution CT. J Comput Assist Tomogr2005;29:544–8.
. Usual interstitial pneumonia. Quantitative assessment of high-resolution computed tomography findings by computer-assisted texture-based image analysis. Invest Radiol1997;32:566–74.
. Classification system of the CT images with nonspecific interstitial pneumonia. Journal of the Institute of Image Electronics Engineers of Japan2004;33:180–8.
. Validation of CALIPER (Computer-aided lung informatics for pathology evaluation and rating) for the non-invasive assessment of pulmonary nodules of the adenocarcinoma spectrum. European Respiratory Journal2012;40.
. The Lung Tissue Research Consortium: An extensive open database containing histological, clinical, and radiological data to study chronic lung disease. Insight Journal2006.
. Theory of spin-exchange optical pumping of 3He and 129Xe. Physical Review A1998;58:1412–39. Contributors NDW and JAE conducted the literature searches and NDW wrote the first draft of the manuscript. JMW arbitrated any disagreements, supervised the study and edited the manuscript. NJS, BJB, AJS and SMB contributed to identifying key articles, contextualising the findings and editing the manuscript. Funding The authors are part-funded by the Medical Research Council (MR/M008894/1) and the National Institute of Health Research (NIHR-RP-R3-12-027). This work is also supported by the TRISTAN consortium work package 3, which is focused on exploring novel techniques to develop biomarkers for interstitial lung disease (ILD), with a particular focus on better defining and quantifying changes that occur in drug-induced ILD. Such biomarkers may enhance our ability to identify toxicity in early intervention studies or play a role in sensitive screening of patients on established medications. The research receives funding from the Innovative Medicines Initiatives 2 Joint Undertaking under grant agreement No 116106. This Joint Undertaking receives support from the European Union’s Horizon 2020 research and innovation programme and European Federation of Pharmaceutical Industries and Associations (EFPIA). Disclaimer The views expressed in this publication are those of the authors and not necessarily those of the National Health Service, the National Institute for Health Research or the Department of Health. Collaborators on behalf of the TRISTAN Consortia.